Fold to create a square. Fasten one set of buttons. Place head through the hole created and position buttonson your shoulders. Fold to create a square. Fasten one set of buttons. Place head through hole created & place fastened buttons to the front of garment. 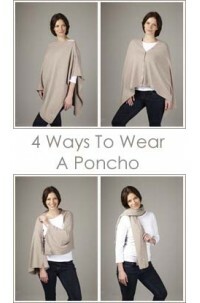 Take the Poncho with its buttons undone and fold lengthways. Fasten all buttons to create two sleeves. Take the Poncho with its buttons undone and fold lengthways. Fasten all buttons and place around neck and fold to show buttons.